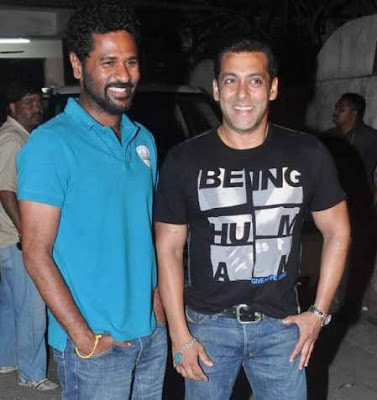 Director Prabhu Deva to direct Salman Khan, again! 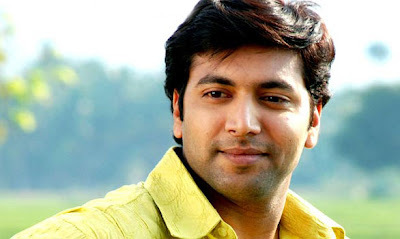 Actor Jayam Ravi in dual role in Nimirndhu Nil! Things can't get better for Prabhu Deva in Bollywood. Reports have it that he will be helming his 'Wanted' actor Salman Khan aka Sallu Bhai, for the second time! The film will be produced by Tips and will go on floors towards the fag end of 2013. Only recently, IG reported that Prabhu Deva will be remaking Tamil blockbuster 'Ayan' in Hindi for Tips, thus its said Salman will play the lead role in the remake of the commercial venture on smuggling. Tips has reportedly confirmed a film with Prabhu Deva and Salman Khan but nothing about the subject has been announced, however industry insiders have it that this will be the Hindi remake of Ayan. Prabhu Deva is currently working on the Hindi remake of Nuvvostanante Nenodantana in Hindi with Girish and Shruti Haasan in lead roles. Jayam Ravi will be seen in a dual role in Nimirndhu Nil. It will see him as a 24 year old youngster and a 48 year old middle man in the film that tracks his life from the age of five. Amala Paul will be seen as a youngster who has completed her under graduation and is searching for a job in Nimirndhu Nil. "Girls today have to lie a lot so as to be safe. When a girl goes out a group of 3 - 4 will follow her out of which she has to smile back at one so he will safeguard her from the others. A girl has to be a part of these lies to lead a normal life and Amala will do just that in the film", says Samuthirakani. Produced by Vasans Visual Ventures, the film is a Tamil - Telugu bilingual with music by GV Prakash. It looks like Sada who has so far had the 'touch me not' girl-next-door image is trying hard and push the envelope for her comeback. The actress who was seen in dignified clothes seems to have chosen a skin show route to make it happen. After a brief hiatus, she has signed a bilingual Tamil and Telugu – Mythili in Tamil and Mythri in Tollywood where she was said to have indulged in some skin show. The actress for the first time is appearing in a swimsuit for a song sequence with the lead actor Navdeep in the film. An inside source revealed that the Jayam actress didn't have any qualms — be it wearing transparent chiffon sarees or a swimming costume. Watch out for their on-screen chemistry which is going to rock, he assures. Surya Raj directs the movie. 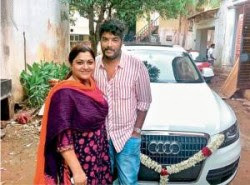 "Surprises are my expression of love," says Khushboo who has gifted her husband, Sundar C., an Audi Q5. After so many years of married life, Khushboo still maintains the spark in the relationship in her own way. "Sundar means a lot to me," she says, "He is my love. I love to surprise him. I have been planning to give him a gift for quite a long time. He loves cars and gadgets. So, I decided to go with the Audi. He was overwhelmed. He said that it was beyond his expectations." Sundar was apprehensive initally, as the car is an expnsive one. Khushboo said. "He was touched by my effort. It's not about the price, it's about making him happy. These little gestures like keep us going and help retain the spark in a relationship." The actor is busy with her TV shoots and politics, but she manages to spend some quality time with her family. Ask was there any special reason for the surprise, she says, "He deserves this gift for the success of Kalakalappu. My gift will motivate him to aim for bigger success in his upcoming films." Kalakalappu was a breakthrough for Sundar after the film became one of the biggest hits this year. "As a producer of the film I didn't pay his remuneration. I am making up for it with the Audi," says the actress with a smile. Has he ever surprised her? "No, not so far. If he gifts me something, there can be no bigger surprise than that itself," Khushboo laughs. Sundar C., is currently working on MGR with Vishal, Varalakshmi and Anjali. Ileana is very happy with the warm response she has got so far for Barfi, her debut film in Bollywood with Ranbir Kapoor and Priyanka. The petite and pretty actress revealed that she was earlier offered an opportunity to work with Salman Khan in Wanted which was the Hindi remake of Pokkiri. Ileana was part of the Telugu version which had Mahesh Babu in the lead and was directed by Puri Jagannadh. Prabhu Deva directed the Tamil version with Vijay and Asin and the Hindi version with Salman and Ayesha Takia. The Nanban heroine said that she had been excited about working with Salman but felt at the time that she was not ready for Bollywood and so had allowed the opportunity to slip through her fingers. Ileana admitted that she would love a chance to work with Salman again. However, she was quick to clarify that she had no regrets and was proud to make her debut with Barfi.